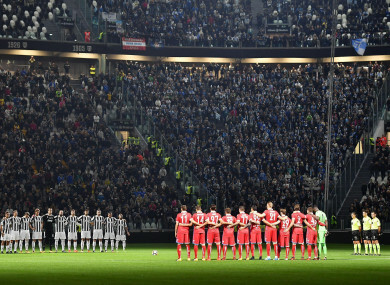 Players observe a minute of silence prior to the Serie A soccer match between Juventus and Spal at the Allianz Stadium in Turin. EMOTIONS WERE STILL running high in Italy, days after Lazio fans posted anti-semitic photos of Anne Frank in a Roma jersey as new incidents during Wednesday’s Serie A action overshadowed planned tributes. As Lazio’s ultras ‘Irriducibili’ fans announced they would not travel to Bologna for the team’s game, isolated supporters who had made the journey sang the Fascist song “Me ne frego” (“I Don’t Care”) in the stands of the Dall’Ara Stadium. Lazio players, as planned, warmed up prior to the game, which they won 2-1, wearing a jersey with an image of Frank alongside the words “No to anti-semitism”. On all pitches on Wednesday, rival captains and referees handed children copies of Italian Jewish writer Primo Levi’s memoir of deportation “If This Is A Man”. Extracts were read from “The Diary of Anne Frank” before a minute of reflection on the Holocaust as requested by the Italian football federation, which quickly turned into a minute of applause in most stadiums. But in Turin, where champions Juventus were playing SPAL, a section of the crowd turned their backs on the pitch and sang the Italian national anthem, while at Rome, where AS Roma met Crotone, some fans drowned out the reading with chants in favour of their team. Earlier Wednesday a wreath of flowers which Lazio president Claudio Lotito had presented to the Rome synagogue was found floating down the Tiber river which runs through the capital. But by early Wednesday the blue and white flowers — the colours of the Rome club — had disappeared from the synagogue entrance. It is believed they were flung into the river by youngsters from the Jewish community angered by Lotito’s note “you have Jewish brothers”, according to Corriere della Sera newspaper. Il Messaggero published a recording in which Lotito appeared to describe the visit to the synagogue as “theatrics we have to do”. Lotito denied uttering such words and Democratic Party politician Dario Ginefra, seated beside Lotito on a Monday night flight from Milan to Rome where he was alleged to have made the call, backed the Lazio president. Lazio — who are fourth in the table just three points behind leaders Napoli — had already been given a two-match closure of the north end of the Stadio Olimpico for racist chanting. It would be wrong for the team to be docked points as we’d become hostage to these people going to the stadium just to create chaos,” he told Radio Capital. Israel’s sports minister, meanwhile, called on her Italian counterpart to deal with racism in sports. In a Tuesday letter to Luca Lotti, Miri Regev expressed her “horror” over the “despicable use” by Lazio football fans of Frank’s picture. “It is not new that Lazio fans have for many years been acting as a pro-Palestinian, anti-Israeli organisation and among the many fans, there are thousands who openly bear neo-Nazi symbols,” Regev said. Email “Fresh controversies overshadow Anne Frank tributes in Italy”. Feedback on “Fresh controversies overshadow Anne Frank tributes in Italy”.